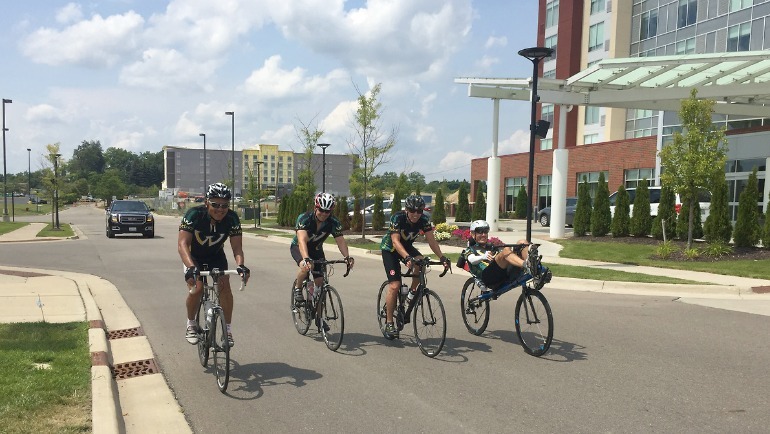 Wayne State University President M. Roy Wilson will visit four Michigan cities in four days during the second annual Road Warrior bicycle tour July 23-26. He will travel more than 500 miles on the journey. With four biking companions, Wilson will leave Wayne State’s campus early in the morning of July 23 and cycle to Marshall. On July 24, the cyclists will travel to Holland. From there, they will cycle to Owosso, and then to Imlay City. On July 27, the group will return to Wayne State’s campus, having cycled more than 500 miles in five days. In each city, Wilson will host a reception at a local restaurant where community members can gather to learn more about Wayne State, which is celebrating its sesquicentennial this year. Free food and beverages will be available at each reception. July 23 (Marshall): Dark Horse Brewing Co., 5:30 to 7 p.m.
July 24 (Holland): New Holland Brewing, 5:30 to 7 p.m.
July 25 (Owosso): Wrought Iron Grill, 5:30 to 7 p.m.
July 26 (Imlay City): Hiram’s Tavern, 5:30 to 7 p.m.
To secure your spot at one of the receptions, go to rsvp.wayne.edu/2018roadwarrior.